The work of the MilkIT project to enhance dairy-based livelihoods in India and Tanzania through feed innovation and value chain development approaches was recently reported in IFAD’s 2016 annual report (pages 82-84 of the full version; related news story). 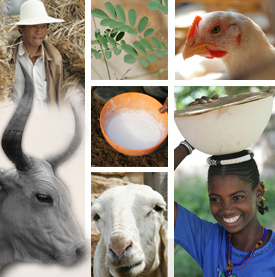 Across the world, livestock provides food and income for almost 1.3 billion people. Dairy cows are particularly important both nutritionally and economically. In India and Tanzania, innovative feeding strategies – introduced by an IFAD grant – have increased milk production and boosted small farmers’ food security and livelihoods. From 2011 to 2014, IFAD funded a programme for enhancing dairy-based livelihoods in India and Tanzania through feed innovation and value chain development approaches. Better known as MilkIT, the programme was led by the International Livestock Research Institute with the International Center for Tropical Agriculture (CIAT) and partners. The programme connected poor dairy producers − many of them women − to value chains and knowledge-sharing platforms to improve feeding methods. Some of the changes introduced were simple but significant. In India, for example, feeding troughs helped farmers from seven villages cut down on waste. Initially, only 1 per cent of participating farmers owned a trough. The rest put feed on the ground, leading to high wastage of forage, more labour when cleaning out the cattle sheds and increased risk of transmission of animal diseases. participants, most of whom were women. This contributed to the adoption of the new troughs, and as a result the average rate of fodder wastage fell by half. Meanwhile, in Tanzania, MilkIT trained smallholder farmers in different methods of feed production and conservation. Dairy farmers learned to use a box-baler to make hay from natural grass or maize by-products. This inspired some farmers in Mbuzii, a village in Lushoto district, to make their own baler, which they demonstrated at a district agricultural show. Now, 40 farmers in Ubiri have adopted the new technology. to join and sell milk through them. As MilkIT demonstrated, technical feed interventions and marketing interventions are most effective when implemented together, as they depend on and support each other’s success. For example, participants in the innovation platforms identified that increasing the quantity of good quality feed depended on finding a cheap, easy way to cut chaff and make it more palatable for the animals. After smallholder dairy farmers tested forage choppers already available with local dairy cooperatives, MilkIT identified an entrepreneur who was available to supply the chosen model in remote areas and facilitated the acquisition of such forage choppers by groups of farmers. This enabled them to produce better, more plentiful feed and thus increase milk production and incomes. IFAD is looking at ways to scale up the successes of MilkIT. In Uttarakhand (India), the findings may be implemented in the IFAD-supported Integrated Livelihood Support Project. In Tanga (Tanzania), the lessons learned have been fed into the national Maziwa Zaidi dairy development initiative linked to CGIAR’s livestock research programme. The innovation platform process has been adopted by local stakeholders and applied in other contexts. Tags: IFAD, milkIT. Bookmark the permalink.